At Brooklyn Collaborative, one of our Network Schools in Brooklyn, college and career readiness is a central part of the school culture. As a part of that focus, all 11th graders participate in semester-long internships at a local business or organization to get hands-on work experience, sometimes their first work experience. And as a complement to their internship, they also take an Internship Seminar class that teaches skills like resume writing, professional communication, and time-management, as well as provides opportunities to learn from guest speakers from a variety of industries, and even college campus visits. Over the past two years, this course has been deeply enriched thanks to a partnership with Salesforce. 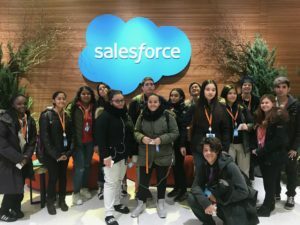 This October, in fact, a group of Internship Seminar students went to the Salesforce office here in NYC to learn about technology careers, such as information technology and software engineering. Salesforce volunteers gave the students a tour of the office and talked about the career and educational pathways that led them each to Salesforce. They highlighted their own internships and previous jobs and talked about the mentors who helped guide them along the way. The Salesforce team emphasized that there are a lot of ways to land a dream job and that there’s no one single path to success, a message the Brooklyn Collaborative students were eager to hear. At the end of each semester, the Internship Seminar class culminates with a Model Job Fair, where the student interns represent their organizations and conduct mock interviews with their 10th-grade classmates, who will be taking the class the following year. 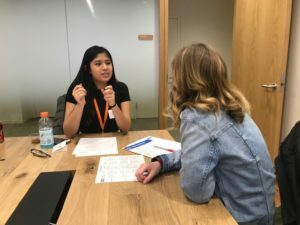 In order to prepare for the fair, Salesforce invited all of the 11th graders back to their office to practice their internship presentations and conduct mock interviews. The volunteers also reviewed student resumes and helped them craft their personal elevator pitch, skills that the students will be using as they pursue job opportunities beyond their internships. We can’t thank Salesforce enough for the fantastic and diverse examples they set for our students, and for always encouraging them to work hard, stay focused, and pursue their dreams relentlessly.